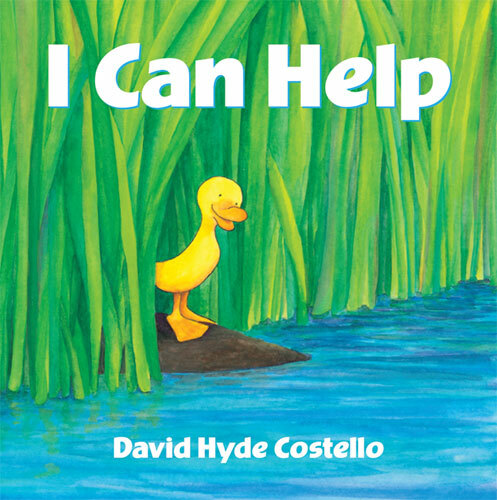 Author Visit: David Hyde Costello, Author of I Can Help and Here They Come! You want to know why I love my job? As if those weren’t enough, one of the top reasons I love my job is that, on the rare occasion, an author will unexpectedly stop by for a visit. Those are some of the best days of all. Working at a bookstore in the Pioneer Valley, where the old adage says you can’t throw a stone without hitting a children’s book author or illustrator, greatly increases the chances of a surprise visit. Today, I got one from author/illustrator David Hyde Costello! David is the author of Here They Come! 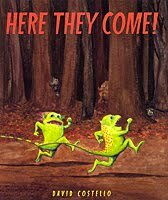 (9780374330514, Farrar Straus Girroux – Macmillan, $15), a really fun Halloween book told from the point of view of small monsters. You see the monsters celebrate Halloween with a big party until strange creatures show up wearing all kinds of crazy costumes and scare the monsters away. Can you guess what type of creatures are beneath those costumes? (Answer: Human children.) Wonderful for storytime with a crowd, or if you’re taking a closer look, make sure to keep an eye out for the sneaky subplots happening in the illustrations. SIGNED COPIES AVAILABLE AT THE ODYSSEY BOOKSHOP. David’s newest book is I Can Help (9780374335267, Farrar Straus Giroux – Macmillan, $12.99). In addition to the simple, colorful illustrations, the trim size is my favorite part. This book is perfect for the little hands of the youngest picturebook reader. The charming story is perfect for that age, too, about baby animals helping each other in various ways. What child hasn’t said, “I can help!”? SIGNED COPIES AVAILABLE AT THE ODYSSEY BOOKSHOP. Thanks, David, for stopping by!